You’d want a dolly that works – who doesn’t? For any tool or equipment to work, it has to be compatible with the job you have for it. When you’re constantly moving loads that require balanced handling and muscle flexing, you’d have to get yourself a 4 wheel dolly! Why do you need a 4 wheel dolly? 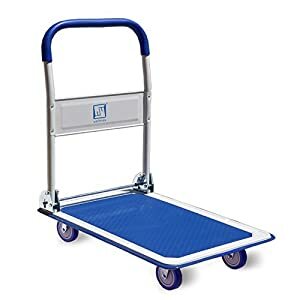 Your usual cargo weighs well beyond the load capacity of standard hand trucks or so enormous that a hand truck would tip over. You’re constantly transporting delicate cargo that needs to be entirely supported under the base. You need a level platform for special items, not the tilted support that you get with a hand truck. You have a problem balancing your load. With four wheels, this dolly takes balancing off your mind and allows you to focus on steering. In short, if you need to move a heavy object horizontally, the best way to do it is by a 4 wheel truck. Nothing beats the 4-point stability and great strength that a flat dolly provides. What are your choices when it comes to 4-wheel dollies? We have a great selection of 4-wheel and multiple-wheel dollies, and you can choose based on load capacity, shape, material, or function. Load capacity – dollies vary by the weight they’re designed to carry. Plant or bucket dollies (also called caddies) are usually designed for 200-300 pounds. Most drum dollies have capacities of up to 1000-lb because they’re designed to carry drums filled with at least 55-gallons of water. Panel carts are designed to roll out drywall or steel panels weighing up to 2500 lb. Vehicle dollies with built-in jacks have capacities of up to 5,200 pounds and are most useful in showrooms or car shops. The huge job of repositioning immobile vehicles becomes child’s play with these tools. Factories and warehouses make use of 4-wheel dollies with 10,000-lb capacity or more for moving heavy equipment and materials. Shape – since dollies mainly act as moving platforms, they are usually square or rectangular. Those for pots, buckets, and drums have round shapes. Most dollies have no handles although some types have. Others are designed with partitions, especially those for transporting panels or furniture frames. Material – dollies are manufactured using various materials – including molded plastic, industrial-grade plastic, steel tubing, steel sheets, stamped metal, aluminum tubing, extruded aluminum, treated wood, and other heavy-duty materials. Wheels – wheels, too, vary depending on function and design load. They can be rollers for moving in straight directions or wide-angled turns, but definitely casters for moving around tight corners. Plant caddies do well with 2” rubber wheels or PU casters, but those bearing much heavier weight or dealing with uneven terrain may need 8”-10” pneumatic wheels or steel casters. Function – you will find different types of flat dollies in this website depending on your intended use. Caddies for potted plants and buckets are among the smallest and lightest items. But they all go bigger and tougher after that, not to mention more innovative. We have stackable bins on four wheels, shopping baskets with stair-climbing wheels, and even a battery-powered 4 wheel dolly! There’s always the perfect dolly for your purpose, so go find and use it. I’ve kept saying this, and I’ll say it again – use the right tool for the right job. And that’s true for dollies – don’t hesitate about getting the 4 wheel dolly if the job calls for it. The dolly’s load capacity is your yardstick. If you’ve already done that, congratulations! You’re ready for the move. Oh, and a few other things – don’t forget to plan your route ahead of every move. Measure entryways and inspect curves. Make sure that you have an unobstructed view of your path. If you’re new at this, do your homework diligently and don’t be shy to ask for assistance. The dolly is just your tool, you’re still the mover.